Note: This is the story of how Ajax and I experienced and dealt with his seizures. It is not meant to provide any medical advice - please consult a vet, because the causes and symptoms of epileptic seizures in dogs vary greatly. However, it does provide some reference points to begin your own investigations into possible solutions. March 23, 2001, 3:25 PM EST, Residence Inn in Cherry Hill, New Jersey. Ajax had just suffered a grand mal seizure - his second of the day. The monster has first come that day at 8:50 AM. My wife and I, along with Ajax, had made the hurried trip to New Jersey from North Carolina very early on March 19, when we had received word that the birth mother we had been working with was in labor. We were in a hotel room over 400 miles from home, anxious over finalizing the adoption of our first child, and my best friend, a 90 pound golden retriever, had suffered two horrific epileptic seizures, complete with jerking limbs and salivating mouth, in less than 8 hours. This was the defining moment in a frightening 8 months, beginning on January 15, 2001 at 6:30 PM (yes, I have all the dates and times documented), that saw Ajax suffer from 7 grand mal seizures, approximately one month apart except for the March 23rd incidents. During the first seizure in January, I kept amazingly calm, even though I had not experienced anything like it before, in humans or animals. After Ajax's convulsions stopped and he regained his bearings and realized where he was, we rushed him from our Chapel Hill, North Carolina home to the Cary Emergency Veterinarian Clinic. After Ajax was examined, we discussed the events with the vet on duty, and learned that Ajax had suffered from a grand mal epileptic seizure. While Ajax was 4 1/2 years old with no prior history of such problems, the vet said the causes of epilepsy were generally difficult to determine, and Ajax's seizure may be isolated or may happen again. The monster visited again at approximately 4 AM on February 13th. Something woke me up around that time, and I found Ajax disoriented, with a lot of saliva around his mouth, and his couch in the basement smelled of the foul urine, that he also had expelled the first time. He usually sleeps on my bed, but sometimes goes down to his couch. After this second episode, I decided that I had to educate myself on this disease. I needed to learn causes, cures, and anything that would help Ajax avoid future seizures. To this end, I began spending an hour or two a day doing research on the Internet. 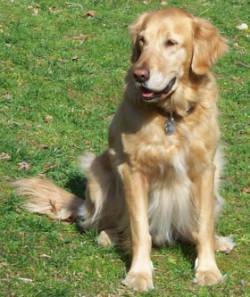 The first real break came when I found the Canine Epilepsy Resource Center, at http://www.canine-epilepsy.com. This site had many excellent articles to begin my education, but most importantly, the owners of the site also managed the Epil-K9 email list. 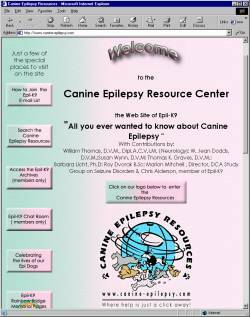 This was a moderated listserv, where members posted questions, answers, comments, resources, support, etc on canine epilepsy. Epil-K9 was very active, and I ended up receiving 30-40 emails a day from the group. So, I soon found myself devoting about 10-20 hours per week searching for answers to Ajax's problem - my quest was now a part-time job. Early on, I decided that fighting the monster with drugs like phenobarbital (http://www.canine-epilepsy.com/Phenobarbital.html) and potassium bromide (http://www.canine-epilepsy.com/Bromide.html) should be my final option. Phenobarbital, or PB, could cause liver damage without careful monitoring of serum levels. Other possible side effects included sedation, ataxia (loss of coordination), and the 3 P's: polydipsia (excessive thirst), polyuria (excessive urination) and polyphagia (excessive eating). Weight gain is also common. Potassium bromide, or KBr, sounded like a better option, though the side effects were similar to those with PB. As well, dogs can develop a skin rash or itchy skin in some cases. Overall, the message was that KBr was a better choice if possible, though PB may be necessary. Unfortunately, KBr was also associated with hind end weakness, and since Ajax had hip dysplasia, this was a big concern to me. I don't mean to warn people away from using these drugs, only that, in my opinion, drug therapy should be a last resort. Notice that I qualified the previous statement about drug therapy being a last resort using "in my opinion". I did this because most people in the Epil-K9 group advocated getting the dog on drugs as soon as possible to control the seizures. Also, the consensus was to try KBr first, given that it had fewer and less severe possible side effects. I discussed this with my vet, who said that KBr was just for cluster seizures - an opinion not shared by the Epil-K9 group. At this point, I realized that I had learned as much if not more than some vets about the causes and treatments for canine epilepsy. I certainly did not know all, or even most, of the internal physical issues, but I believe my many hours of online discussions with people (including some vets) who have dealt with this disease in their pets had provided a larger set of options than some vets could provide to patients during a normal office visit. After the multiple seizures in March, I stepped up my research. I felt like I was racing against time now, as I knew seizures had the potential for serious damage, especially if they increased in frequency. The monster feeds off its own actions. Plus, the Epil-9 group's consensus was that delaying anti-seizure medication could make it harder for them to control the seizures when they do finally get introduced, something referred to as the 'kindling effect'. Finally, I read horror stories from the group about cluster seizures, where a dog experiences a series of agonizing seizures. Several chilling stories I read have been permanently burned into memory, and still scare me. In fact, this led me to insist on getting liquid rectal valium, which could alleviate clusters in progress. On top of all the above issues, of course, was the unspoken concern between my wife and I about the danger posed to our new baby by Ajax's seizures. While he would not normally hurt a living thing, when he first comes around after a visit from the monster, Ajax is disoriented and can growl and appear aggressive when approached. It doesn't last long, and has lessened from the first seizure (though maybe we just got more cautious). I couldn't even consider giving Ajax up - he was my best friend, slept with me, and went everywhere with me (consider that we even had him in New Jersey during adoption proceedings!). And oh, by the way, he saved my life after I lost the first dog I ever owned. This new puppy had given me a reason to get up in the morning, to go outside and exercise, getting me through a very, very black and dangerous period. But that's another story. So, I was frantic to find a solution. There were proponents of homeopathic approaches in the Epil-K9 group, but I was very skeptical. In fact, I had consulted a homeopathic vet a month or so before Ajax's first seizure, but in regards to an elder cat with kidney disease. The pills and powders did not seem to help the cat, Iggy, other than to cause additional distress. This homeopathic vet also suggested an alternative to the GlycoFlex glucosamine pills I had been giving Ajax for a couple of years to alleviate hip dysplasia problems. This alternate was a jerky-based treat called Sea Mobility, which also had glucosamine. 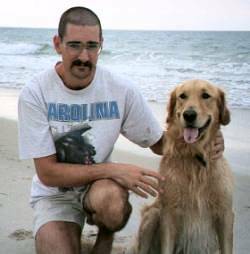 Ajax started on Sea Mobility in January of 2001, shortly before his first seizure, a troubling coincidence. In later analysis of the product, I noted it contained evening primrose oil, one of a long list of potential seizure triggers. Someone in the Epil-K9 group also pointed out that the dextrose and corn syrup were sugars that could aggravate arthritis. I discussed the possible connection between Sea Mobility and Ajax's seizures with both the company I bought it from and the manufacturer, and neither one could recall similar results. I went back to GlycoFlex and received a refund on the unused portion of the Sea Mobility. Incidentally, I also discontinued the homeopathic treatments on Iggy, who is now doing great at 19 years old with bi-weekly fluid treatments. Thus, I did not have faith that the homeopathic approach could beat the monster. I tried a few other hit and miss tactics, including adding the highly regarded Missing Link supplement to Ajax's diet. Also, many people on the Epil-K9 list sang the praises of the of the BARF diet (sources listed at http://www.canine-epilepsy.com/healthydiet.html). BARF stands for 'Bones and Raw Food' (or 'Biologically Appropriate Raw Food', depending on the source), and, as indicated, is a diet predicated on feeding animals raw organic foods. This led me to further investigate commercial pet foods, and the claims and concerns of BARF proponents made a lot of sense. Even though Ajax was being fed a very high quality, premium dog food (Innova), it looked like I could do much better for him, nutrition-wise. I bought a BARF book, and began introducing some raw foods and bones into his diet, but I couldn't make the complete leap. The prescribed one day per week of fasting, plus the raw vegetables that Ajax would not eat unless he was starving, made it too difficult to implement. I knew I'd give in to that pleading, golden retriever face. Plus, as I learned more about it, BARF just didn't 'feel' right to me. But, the investigation into foods opened up a new avenue. I wondered if Ajax's frequent scratching and chewing signaled an allergy that contributed to the seizures. This led me to try a different premium dog food, California Natural, which was based on lamb meal and rice and formulated for sensitive or allergic dogs. The behavior did not change, and the monster stopped by on May 26, this time at 3 AM while Ajax was sleeping on my bed. The few changes I had tried may or may not have helped, but he had made it 64 days between seizures. However, as anyone who has dealt with the monster will attest, you are always worried when the next visit will come, and when it does, you are even more scared of a step up in frequency. I had a strong feeling that a nutritional approach was a very promising avenue. 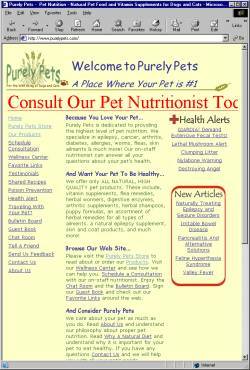 This led me to PurelyPets (http://www.purelypets.com), a Web-based company catering to pet nutrition with supplements and consultations. PurelyPets had a contentious relationship with the moderators of the Epil-K9 group. I don't know all the details, but it boils down to a company that sells things participating in Internet discussions. I didn't see any spamming or hard sell tactics, and in fact only discovered them from another member of Epil-K9 who praised PurelyPets for the help they had provided. After contacting PurelyPets and requesting a consultation, they emailed me a comprehensive questionnaire about my pet and his problems. I filled everything in and emailed the response back on a Friday, and we set up a phone conference for the next Monday. Darleen of PurelyPets was thorough, empathetic, and very clear in her advice. The main thrust was to provide cooked meals to Ajax, along with regular snacks to avoid prolonged periods (more than 4-6 hours) without eating. She provided detailed meal recipes, and a wide variety of suggestions for snacks. Of course, she also suggested a supplemental product called EpiPlus along with a nutritional supplement containing various vitamins and minerals, both sold by PurelyPets. Other material she provided focused on cleaners and other potential chemical and natural sources that could trigger seizures. I examined all our cleaners, bug sprays, soap, shampoo, etc. One suggestion involved going back to clay litter for the cat boxes, getting rid of the clumping litter I'd been using. If this litter binds up into a dense ball in the box, what happens when Ajax or the cats get some on their paws and lick it off? Scary. Anyway, the recipes were not difficult, but I am a typical male - I lived alone through most of college, and anything that took more than one pot was too much trouble to make. On top of that, I was a vegetarian, and cooking meals for Ajax would have me buying and using various meats. Even so, I quickly got used to mixing everything up in the crock pot, making enough for at least several days at a time. I also got accustomed to giving the periodic snack to Ajax - rice cake with peanut butter, boiled egg, fruit and cottage cheese, etc. In fact, I was so determined - and motivated - that I even set the alarm if I was going to be sleeping more than 6 hours or so, so I could get Ajax something to eat without making him go too long without. The two supplements I used were EpiPlus (about $50 for 6 month supply), a powder that I sprinkle on his food, and MegaPet Daily (about $35 for 6 month supply), a vitamin supplement that I pop open and sprinkle on his food. I also continued giving him GlycoFlex pills for his hip dysplasia. With the nutritional approach in full swing, Ajax had another seizure on July 5th. While this was discouraging, I really felt like I was on the right road. Maybe we both just needed some time to get acclimated and doing everything right. My detailed notes do show that Ajax had missed a snack and gone almost 7 hours at the time. Then, the monster hit again on August 2nd. Of course, now I was running out of options, and had to seriously start looking at anti-epilepsy drugs - weighing the potential bad side effects. Two bright spots, however, were that the seizures were spaced out about a month, and that in the last instance I had the discipline to grab the honey bottle and squirt some in his mouth, which stopped the seizure. Recently, I had placed squirt bottles of honey in every major room where Ajax went, based on what I read about the effects on seizing animals. (Extra care should be taken, of course, as the seizing animal could become aware enough to perceive your actions as a threat!) The monthly seizures even sent me to the Internet to research full moon dates, to determine if there was some correlation. There was none, and it looked like the best all the work and research had resulted in was regular, spaced out seizures. So, on August 2nd, the counter was reset - everyone with an epileptic dog knows about 'the counter', or the number of seizure-free days. As September approached, I became more and more nervous, watching Ajax and jumping at the slightest twitch in his sleep. I would wake up in the middle of the night and pet him as he lay next to me in bed. No matter what was going on in my life, I did not let 4 hours go by without a snack of some sort. And, September passed without incident. Then October passed, and early November saw us cross the 64 day period achieved before the monster came in May. We cruised smoothly into 2002. Even as the seizure-free days piled up, I kept to the regimen and, somewhat superstitiously, did not mention our success to anyone, even on the Epil-K9 group. Why tease the monster? I was feeling better and better, yet remained very apprehensive and jumpy. Ajax would be having a wonderful dream about chasing squirrels, running along in his sleep, and there I'd be, concerned and stroking him to calm him down - and vaporizing his pleasant fantasies. In March, my wife gave birth to our second child, and even with all the needs and concerns brought on by a two-month premature birth and month long hospital stay for the baby, I was worried about how the stress of the event might affect Ajax. Would it unleash the monster again? Thankfully, the baby turned out healthy, and Ajax and I went on to celebrate our one year anniversary without a visit from the monster on August 2nd, 2002. I even felt confident enough to relate my success to some people. Now, as August 2nd, 2003 approaches, I feel daring enough to write about our battles with the seizure monster. I still cook for Ajax, and I still give him regular snacks, though sometimes I let 6+ hours go by (but never 7 hours). He still takes EpiPlus and MegaPet supplements, and there are still convenient squirt bottles of honey in various rooms of the house. Before giving Ajax any food or snack, I check the ingredients for possible triggers, and I also receive and read ASPCA poison control alerts. And, since vaccinations are often referenced as seizure triggers, before Ajax receives any boosters I have titers done so the vet can check the levels in his blood and determine if the booster is really needed. Cost is about $70, compared to the $8-15 cost of the shot, which might well be needed anyway. I've read about some much cheaper procedures on the horizon for checking blood levels, but I don't complain. Many people who hear this story ask about Ajax' weight - surely, such regular feedings and snacks have made him overweight, right? Well, Ajax has always had regular exercise - at least one 1.5 mile or more walk EVERY day, plus play time, plus a short late night walk. I monitored his weight carefully, as his hip dysplasia could be worsened if he gained too much. On January 19, 2001, immediately after the first seizure, Ajax weighed 97.2 pounds - he had gained some extra weight in the past year that I wanted to get rid of. On March 19, 2003, Ajax weighed in at 89.6 pounds. Although I'd still like to see him shed a few pounds, consider that even though he was eating MORE total food in his current home-cooked and snack-supplemented regimen, he had actually lost almost 8% of his body weight. This is even more amazing when you consider how many extras he was getting tossed from high chairs over that period. Based on some prior research into pet foods and various fillers used, though, this was not so astounding. So we come to the bottom line - was the monster defeated via nutritional means, or did he just forget about us? I can't say for sure, but I have a strong feeling based on the experience that the meal and snack approach suggested by PurelyPets was the key. The supplements used likely factored in significantly as well. I do know that it took a lot of hard work and agony to get to this point, and I will not change a thing I am doing. A lot of my apprehension and jumpiness has dissipated over time. However, as I work late at night in my basement, with Ajax snoozing away upstairs, loud bumps still grab my attention, and I race upstairs hoping it was only a thumping tail or jumping cat, and we had not been added back to the monster's regular rounds. Postscript: Ajax passed away in August of 2009, from a growth, likely cancerous, near his heart/lungs. He was a super dog, my best friend, and I miss him every day. Significantly, though, he never had another seizure after August 1, 2001.